WICI proposes an enhanced business reporting framework which focuses on the core part of the company’s unique value creation mechanism. Under this framework, WICI hopes more and more companies will be able to easily present an integrated and comprehensive report on material financial and non-financial elements of the company’s performance, resulting in a better communication with its key stakeholders, which in return benefit the company itself. DVFA – Society of Investment Professionals in Germany materials and research. Download the Excel version of the WICI XBRL Taxonomy for review. The copyright in PricewaterhouseCoopers’ Corporate Reporting materials is owned by PricewaterhouseCoopers firms, and all rights are reserved. For information on the PricewaterhouseCoopers Corporate Reporting program, see www.corporatereporting.com . The WICI acknowledges and thanks PricewaterhouseCoopers for its kind permission to use and base its materials (including, but not limited to, elements of the overall structure of the framework, industry specific frameworks and performance measures, and associated XBRL taxonomies) on the PricewaterhouseCoopers’ Corporate Reporting materials and research. 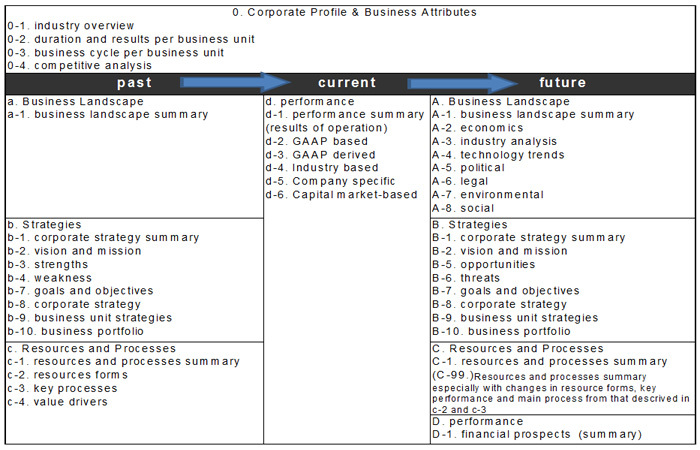 PricewaterhouseCoopers (‘PwC’) first published the ValueReporting Framework in 1999. PwC has continued to develop the ValueReporting Framework (now known as the Corporate Reporting Framework) through extensive ongoing research in the area of corporate reporting. The Corporate Reporting Framework is a codification of PwC’s research in 14 countries and 16 industries on various types of information which are valuable in managing an entity (management’s view) and assessing an entity for investment purposes (an investor’s view). The Corporate Reporting Framework is widely used and referenced in industry and press. Further information on the Corporate Reporting Framework may be found on the www.corporatereporting.com website. ‘PricewaterhouseCoopers’ refers to the network of member firms of PricewaterhouseCoopers International Limited, each of which is a separate and independent legal entity. The copyright in KPIs for ESG – Key Performance Indicators for Environmental, Social and Governance Issues is owned by DVFA – Society of Investment Professionals in Germany, and all rights are reserved. For information on the DVFA – Society of Investment Professionals in Germany, see http://www.dvfa.de. The WICI acknowledges and thanks DVFA – Society of Investment Professionals in Germany for its kind permission to use and base its materials (including, but not limited to, industry specific frameworks and performance measures, and associated XBRL taxonomies) on DVFA – Society of Investment Professionals in Germany materials and research.